Stuttgart, Josef Habbel at Regensburg for Max Hettler Verlag, 1951-1958. 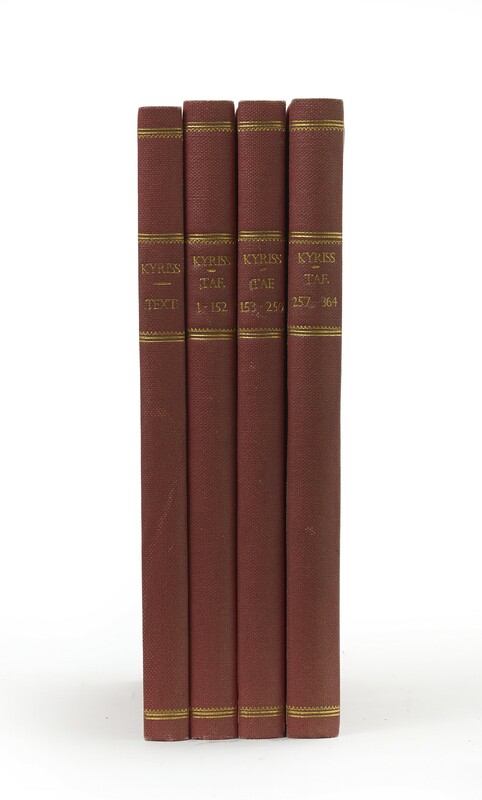 Four volumes (26 cm), I (Text, 1951): 159 (1) pp. II (1. Tafelband, 1953): 185 (1) pp. Plates 1-152. III (2. Tafelband, 1956): 137 (1) pp. Plates 153-256. IV (3. Tafelband, 1958): 157 (1) pp. plates 257-364 (altogether, approximately 2400 illustrations). Uniformly bound in collectorâ€™s red cloth. - A pioneering work for identifying the bindings of German incunabula, based on the author's systematic investigation of forty-three libraries, mostly in South Germany, where he examined 23,800 volumes. Kyriss identifies 186 groups of tools, each one of which probably represents the equipment of a single bindery; thirty-eight of these are monastic binderies, thirty-two binderies which used a name tool, a small number are binderies signing with initials or arms, and the rest binderies associated with a particular town. "The work takes its place among reference books of outstanding importance... With the aid of these plates it should be possible to localize a high proportion of German gothic bindings" (from a review by Howard Nixon of Bildband II, in The Book Collector, Spring 1957, pp.75-76). ¶ Ownership inscriptions and notes ink on endleaves of the bookbinding historian William Smith Mitchell (1908-1982); his pencilled instructions to his bookbinder on half-titles. Loosely inserted are Mitchell's typescript for a review (for Libri, volume 8, 1958, pp.200-201), and several of his offprints.